Located right beside Tembeling River and it is the only accommodation which gives you 180 degree Taman Negara River view. Fall asleep with the sound of streaming river and wake up in the mist of the World's Oldest Rain forest. Free flow coffee & tea with free wifi. Beers sold here too! Strong water jet hot shower provided. Staffs are all licensed nature guides, friendly and provide sharp & useful information. Wild Lodge Taman Negara, a place where you get to enjoy the best hospitality with the lowest budget. Absolutely fantastic hostel! The staff was incredible, and they do a great job of balancing creating a social atmosphere while also making sure people who want to sleep can get some rest. Also - fabulous showers! Would 1000% recommend! 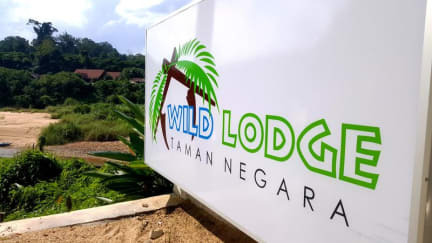 Wild Lodge is a great budget place to stay at Taman Negara. My friend and I have no complaints about the place. The room was clean, and so were the bathrooms. Free coffee/tea, Wi-Fi, drinking water, and beer (to buy) are plus points. You wake up to amazing views of the river/resort right in the room, and can chill on the patio with a cold beer (or a hot coffee, if you prefer). Totally recommend this place in TN. Awesome place to stay, close to the river crossing. They have excellent tour services and give great advice on trekking routes etc. We stayed in the 8-bed dorm room and we had a pleasant stay. The staff is helpful and the WiFi is good enough. 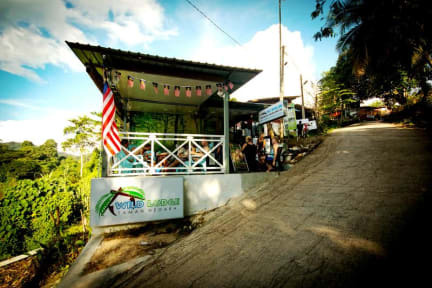 This hostel is located as close to the river crossing as possible and also close to a selection of restaurants - we especially enjoyed Acah Corner. Dorms are cleaned daily and bug repellent is also sprayed daily. Very close to the jetty, nice front porch common area, free tea, nice staff. Bathrooms and bedrooms are fine, nothing remarkable but good enough. No lockers but staff are always around so I wasn't too worried about my stuff. Would stay here again. They do have lockers in the rooms, I had read that they were broken or without keys in some other reviews however they have now been fixed and have keys which you have to give a 10 ringgit deposit for. The 4 bed dorm I stayed in was nice and had enough space, big window facing the river which opens with a sliding door. There is no mosquito net but actually it's not needed as somehow there are very few mosquito there, also they have one of those plug in mosquito repellents in the room. We really enjoyed our stay here. The staff is nice and overall there is a great atmosphere in the hostel. The location is quite nice as well. Huge recommendation for everyone is the night jungle tour, definitely a highlight of our trip. Lovely relaxed hostel in a great location. Staff is really friendly and helps you organize tours into the national park or your onward journey. Facilities are basic but overall decent condition.